Saloon Night Has Volunteers, Residents Dancing to Waymon Lucas Jr. Spirits were high at our last Happy Hour at the Soldiers Home! We had a Catholic University student share a joke with us, and residents who clearly enjoyed the conversation, music, jokes and all the fun. Sometimes we dance at Happy Hour, and this time we did as resident Ray spun tunes from the Golden Era. Resident Chris was the big winner of the trivia contests. Nam Knights Capital Chapter as always supplied the bar — and they tended it. As usual the Nam Knights provided a lot of fun and companionship. The next Happy Hour is the evening of May 31. To join the fun, write volunteerfriendsofsoldiers (at) gmail (dot) com. Story and photos by Liz Cocke and Lori Lincoln. 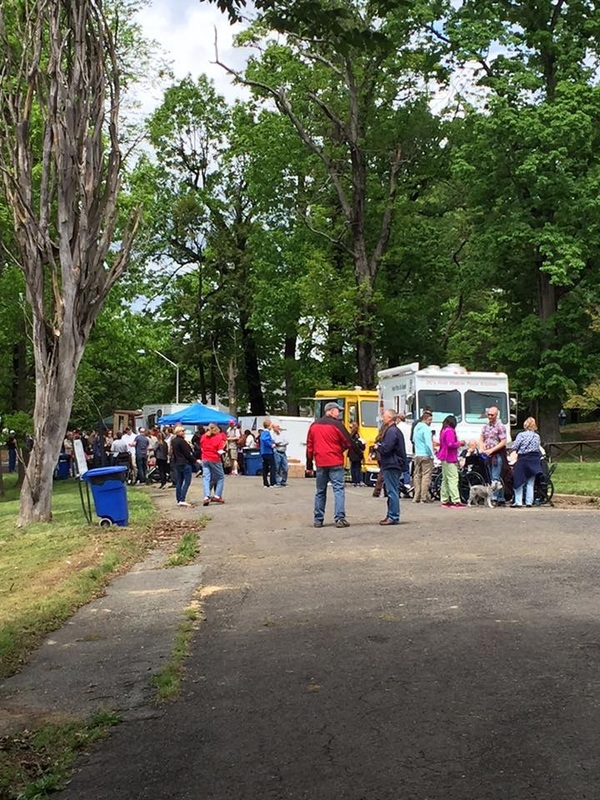 Rain made a brief appearance, but puffy clouds, some sunshine and loads of fun carried the day at the Friends of the Soldiers Home’s fourth annual Spring Fling on May 7. A record number of Armed Forces Retirement Home-Washington veterans participated in this year’s event, making it extra special. Lots of families and many children from the community joined in the fun. Cecily, Herb Spice and the Cinnamonstix and Balance, the George Washington University ballet group, all turned in great performances. Children enjoyed organized games, face painting and running free in the driving range, kicking balls. President Lincoln’s Cottage and Christian Family Montessori School also held fun activities for kids. Food vendors DC Slices, Galang Indonesian, Captain Cookie and RockSalt were top notch, and the nature walk with Philip Blair as always was a good time. None of this would have been possible without our sponsors — DCCX, Anheuser Busch, Annie’s Hardware and Crossfit Petworth. Thank you for your support for this wonderful event! We are also grateful to our great partners for this event — Nam Knights Capital Chapter, Points of Light, Travis Manion Foundation and Petworth News. Above all we are grateful to the residents and staff of the Armed Forces Retirement Home-Washington for welcoming all through their gate and giving such great support to the event. We will see you at the next festival — and it is just around the corner — July 4th! We are grateful to all of our sponsors for this year’s event — Anheuser-Busch, DCCX, Annie’s Hardware, Crossfit Petworth, AFRH, Nam Knights Capital Chapter, Points of Light, Travis Manion Foundation and Petworth News. Friends of the Soldiers Home is proud to announce the final lineup for this year’s Fling, the fourth annual. We can’t wait to see you — come on out for Spring Fling 2016 and enjoy some time with neighbors, friends and distinguished Home residents who served their country so well. See you on Saturday!